The British constitution prohibits the Crown Jewels from leaving the country, a product of the days when kings and queens often pawned the jewels to foreign buyers. There are also considerable risks involved in transporting the historic regalia by sea and land over such a great distance. For these reasons, a new crown was made specially for George V and Queen Mary's trip to India in 1911, where they were proclaimed as Emperor and Empress of India before the princes and rulers of India. The Crown Jewellers at the time, Garrard & Co, made the crown at a cost of £60,000, which was borne by the India Office. The Imperial Crown of India weighs 920 g (2.03 lb) and is set with 6,170 diamonds, 9 emeralds, 4 rubies, and 4 sapphires. At the front is a very fine emerald weighing 32 carats (6.4 g). The king wrote in his diary that it was heavy and uncomfortable to wear: "Rather tired after wearing my crown for ​3 1⁄2 hours; it hurt my head, as it is pretty heavy." Similar to other British crowns, it consists of a circlet with four crosses pattée and four fleurs-de-lis. However, the eight half-arches on top, which join at a typical monde and cross pattée, point upwards in the form of a Gothic ogee arch. The crown is the only crown of a British sovereign to have eight half-arches, in the style of continental European crowns, departing from the tradition of British crowns having two arches or four half-arches. George and Mary were not crowned as emperor and empress at the ceremony; the Archbishop of Canterbury, Randall Davidson, did not think it appropriate for a Christian service to take place in a country where the people were mostly Hindu or Muslim. 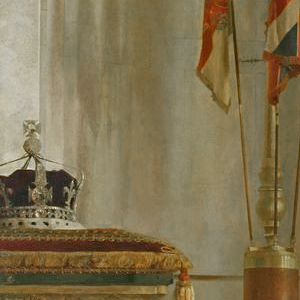 Instead, the king simply wore the crown as he entered the durbar, and the durbar was styled as an affirmation of the king's coronation, which had already taken place in the United Kingdom six months earlier. It has not been used since George V returned from India. On 15 August 1947, the Indian Empire was dissolved and the Dominions of India and Pakistan came into being. George VI and his British Prime Minister, Clement Attlee, agreed that "as long as the two new Dominions remained in the Commonwealth, the crown should be retained among the Crown Jewels, but if at later date one or both were to secede it might be contended that, in view of the fact that it had been purchased out of Indian funds, the crown should be vested in some Indian authority". 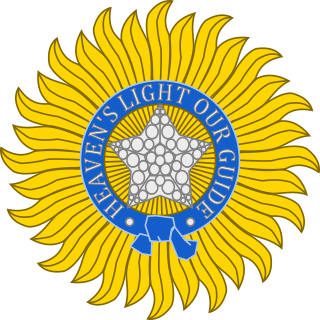 Whilst neither Dominion still exists, their Indian and Pakistani successor states are both still in the Commonwealth. The Imperial Crown of India is on public display in the Jewel House at the Tower of London. ^ a b Mears, Kenneth J.; Thurley, Simon; Murphy, Claire (1994). The Crown Jewels. Historic Royal Palaces Agency. p. 33. ^ a b Younghusband, Sir George (1919). The Crown Jewels of England. Cassell & Co. p. 21–22. ^ "The Imperial Crown of India". Royal Collection Trust. Retrieved 7 December 2015. ^ Edward Francis Twining (1960). A History of the Crown Jewels of Europe. B. T. Batsford. p. 169. ASIN B00283LZA6. ^ Brooman, Josh (1989). The World Since 1900 (3rd ed.). Longman. p. 96. ISBN 0-5820-0989-8. ^ "The Crown Jewels". The Royal Household. Retrieved 7 December 2015. "The Imperial Crown of India". Royal Collection Trust. Inventory no. 31706. The Delhi Durbar was an Indian imperial style mass assembly organised by the British at Coronation Park, Delhi, India, to mark the succession of an Emperor or Empress of India. Also known as the Imperial Durbar, it was held three times, in 1877, 1903, and 1911, at the height of the British Empire. The 1911 Durbar was the only one that a sovereign, George V, attended. The term was derived from the common Mughal term durbar. A cross pattée is a type of Christian cross, which has arms narrow at the centre, and often flared in a curve or straight line shape, to be broader at the perimeter. The form appears very early in medieval art, for example in a metalwork treasure binding given to Monza Cathedral by Queen Theodelinda, and the 8th century lower cover of the Lindau Gospels in the Morgan Library. An early English example from the start of the age of heraldry proper is found in the arms of Baron Berkeley. An Imperial Crown is a crown used for the coronation of emperors. A king-emperor, the female equivalent being queen-empress, is a sovereign ruler who is simultaneously a king of one territory and emperor of another. This title usually results from a merger of a royal and imperial crown, but recognises that the two territories are different politically or culturally and in status. It also denotes a king's imperial status through the acquisition of an empire or vice versa. Durbar is a Persian-derived term meaning the kings' or rulers noble court or a formal meeting where the king held all discussions regarding the state. It was used in India for a ruler's court or feudal levy as the latter came to be ruled and later administered by foreigners. A durbar may be either a feudal state council for administering the affairs of a princely state, or a purely ceremonial gathering, as in the time of the British Empire in India. Coronation Park is a park located on Burari Road near Nirankari Sarovar in Delhi, India. The park is sometimes referred to as the Coronation Memorial; it was the venue of the Delhi Durbar of 1877 when Queen Victoria was proclaimed the Empress of India. Later it was used to celebrate the accession of King Edward VII in 1903, and, finally, it was here that the Durbar commemorating the coronation of King George V as Emperor of India took place on 12 December 1911, subsequent to his coronation at Westminster Abbey in June 1911. This last celebration had all the princely states in attendance. The decision to hold the Coronation Durbars in Delhi at the vast open ground at Coronation Park was a move to emphasise the historical significance of Delhi as the former capital of the Mughal Empire.